Are you particularly fond of red wine, classical music, and Rococo furniture? Do you wear elaborate shirts and velvet frock coats, and feed the remains of your victims to the alligators of the Louisiana swamps? If so, it's time to live up to your reputation and embrace the finer things in life with our French vampire name generator! Grab your violin, your harpsichord, your coffin, a stack of mournful poetry, and the nearest housemaid (or perhaps a sewer rat). Are you a Lestat, a Louis, an Armand, or a Claudia? Are you bold and careless or tortured by your vampiric nature? If you like Anne Rice novels, New Orleans, and 18th Century France, you've found the right place! You can create a random vampiric alter ego, or a unique one that's specifically based on your first and last name. There's options for both male and female vampires, and whether you're looking for a new character for a tabletop RPG like Vampire: The Masquerade, a screen name for an online game, a fun name for Halloween, or to just add some gothic majesty to your day, you've come to the right place! We hope you enjoy this page, and that it brings you plenty of creepy yet strangely alluring fun! Our generator has been online since Emma created it in 2002, when it was actually built as part of the original version. Emma was a particular fan of Interview with the Vampire at the time and decided to make a small tribute to Anne Rice's vampire universe. 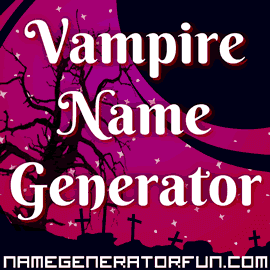 We have the only vampire generators on the net that also include descriptions of your vampire's personality and a sinister underworld title for your vampire. We hope you enjoy finding out your French vampire alter ego – you might also enjoy our werewolf names and cool names. You can also check out the rest of our site by clicking the menu above to see a full list of our naming tools.